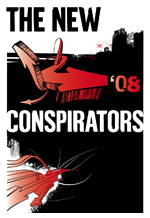 Back in September, Tom Sine emailed me asking if members of YAR could read over the manuscript for The New Conspirators: Creating the Future One Mustard Seed at a Time. I emailed it out to regular contributors and invited feedback. The book looks at four streams of new Christian Expression – emerging, missional, mosaic and monastic. We’ll have a review of the book here on YAR coming soon. The weekend before last, a bunch of folks (including a few from our sister network, the submergents) got together for the New Conspirators conference in Seattle. You can read Mark Van Steenwyk’s concluding report for the New Conspirators conference at Jesus Manifesto. It sounds an exciting time for folks from many streams to incubate ideas and imagine together. I very much wish I could have been there. Christine and I have been invited to keynote at the Mennonite Conference for North America in July. We would like to share bit of what you and your compatriots in the network are doing. Could you send me concrete examples of projects you are involved with? Could you also send me any creative examples of younger Anabaptists who are creating new expressions of church, community, advocacy, celebration and mission? We want to put older Mennos in touch with what you and other younger leaders are doing. Can radical book tours change the world? I don’t think I received the e-mail with the manuscript back in september. would you mind e-mailing that to me? 1) Last year, some of the younger (grad school or early twenties) members of the congregation started a little nonprofit called The Recyclery. It’s mostly about building, fixing and re-selling bicycles, as well as promoting cycling as the eco-friendly and healthy alternative to cars throughout the Evanston/northern Chicago area. They sponsor special outreach rides and are creating a little community of likeminded people, some of whom may not even be believers. 2) Reba has had an on-again, off-again gospel drama ministry functioning within the context of Sunday worship for years. Presently, it’s increasing again in visibility, focus and participants, mostly due to the influx of young people in our church in general, from non-Menno backgrounds, who are interested in the whole Anabaptist “alternative” mindset. Drama, with non-professional actors writing it and performing it, is one good way of “fleshing out” our theology creatively. 3) During Lent in 2006 and 2007, with masking tape, we set up a prayer labyrinth according to the very old (Catholic?) tradition. In labyrith prayer work, one walks through the circular maze slowly, praying at every turn for various concerns both personal and global. We had candles and other classic or symbolic elements incorporated, and publicized times when the sanctuary would be open for silent prayer in this way. It was very moving and powerful when I did it. I tried to do this last year. After a visit to the dump I saw lots of perfectly good bikes being thrown away. But the dump wouldn’t let us scavenge so I couldn’t grab any. You can read the story on my myspace. Myspace.com/somasoul visit my blog (The rich get richer and throw stuff away). I’d provide the link but I’m at work and I can’t get on Myspace. I just wanted to throw out a few examples of young Anabaptists doing some creative work that I’m aware of. 1) Ecclesia Collective in San Diego led by Jason and Brooke Evans. Their stated purpose is to “nurture grassroots expressions of the Kingdom of God in urban San Diego.” They do that through planting churches, sponsoring workshops that promote justice and sustainability, and by reaching out to various immigrant populations in their neighborhood. 3) There is a new Korean church plant in the LA area made up of both Korean immigrants and Korean Americans. The group is closely connected with Fuller Theological Seminary, Pasadena Mennonite Church, and The Pacific Southwest Mennonite Conference. As far as I know, it’s the only Korean-Anabaptist church in the United States. Just here in Oregon, we have a vibrant African church plant that has a broad international connection through their website. And there’s this group called Anawim that is a church among the homeless and mentally ill. The pastor’s kinda off the hook, but the community is really great. The new Mennonite Voluntary Service unit in Elkhart, (called “Jubilee house” because the church that birthed the unit participates in the proclamation of jubilee: the time has come for economic justice, release for the captives and healing for neighborhoods that have been forgotten and tossed aside by city hall, is in full swing with 5 people. All of us in the house are also very passionate about right and healthy relationships on the personal, political, and societal levels. We spend hours together critically analyzing, discussing, theorizing and supporting one another as we try to figure out what our range of experiences here means (spiritually, emotionally, mentally, physically) and as we exist in solidarity with our neighbors. Our stay in the Jubilee MVS house is only one part of what for many of us is a lifetime calling of working for social justice, creating healthy relationships and environmentally sustainable homes. We work on immigration issues, at domestic violence shelters, at centers for community justice, in community gardens, and with people who need wheelchairs (but medicaid doesn’t provide them), as translators, as mentors, etc. In the month of April, we will participate in the development of a Men’s Stopping Violence campaign to eliminate the gender-based violence that is so prevalent in our community and across the nation. Two of us continue work with a global Anabaptist network, in preparation for the 2nd Global Youth Summit in Paraguay in 2009, with Mennonite World Conference. For an upcoming issue of the Seed Sampler, the monthly e-zine of Mustard Seed Associates, we are focusing on “20-Somethings Living Alternatively.” We are looking for stories and examples from college students and young professionals who are seeking to live into the king of God that is already here. How have you responded to the call to be part of God’s redeeming work in the world? Some of you are living in radical intentional community. Some of you grow vegetables without pesticides. Others are volunteering regularly with inner-city kids or homeless families, while still others are throwing regular parties to celebrate family, friends, and life together. You advocate, study Scripture, reject consumerism, paint, sing, dance, pray, and love. We want to hear about it. Please send your stores and examples to Judy Naegeli at mail@msainfo.org by April 14th, 2008. They may be included in the May issue of the Seed Sampler. If you do not already receive the Seed Sampler by email, sign up now! For the past six months, I’ve been passing my days in Nazareth, Israel spending much time at the Fauzi Azar Inn which serves as a sort of community center for staff, volunteers and the local community. The Inn’s primary goal is to offer hospitality to our guests and to build relationships with our neighbors. We come from a variety of ethnic and religious traditions, but our goal of serving others trumps our differences. One of the projects we have been working on together is the Jesus Trail, a 40 mile hiking route that retraces some of Jesus’ steps in the Galilee. We use this initiative as a way to provide a way for travelers to interact with people along the route, building relationships and having a practical way of following Jesus example of a lifestyle that inspired movement, new life and transformation. Four years ago, my family and I moved out of the suburbs at the northern part of San Diego county and into the city. We moved into an old 1930’s craftsmen style home that had a loft above and cottage behind on the property. We left the comfortable, safe and hegemonic suburbs where every home and strip mall seemed the same to a world of diversity and discontinuity. Today, we are a part of a faith community that has evolved around our home, The Hawthorn House. We co-own the property with another family and usually have between 2 to 4 single people that live here with us as well. Some people have moved into the neighborhood to be a part of this community, others were already here in the neighborhood and found a spiritual family with this group. Our community tries to live together by our covenant that we have drafted. Over the last four years, we have hosted house concerts, art shows, forums and teach-ins on a variety of subjects, organized service projects and community activism and have started a community garden. Over these few years, we have discovered that what most of us deeply need is authentic community, a community that nurtures our spiritual formation and calls us each into missional engagement with our city and world. When we gather on Sundays and read Scripture, we ask how these passages apply to each of us individually, our community and our world. What has grown out of those discussions is not a static program but an incarnational approach to living out the Kingdom. All of us are looking for ways in which we can participate with Christ in bringing about his Kingdom. For example, in response to the surprisingly low participation rate of those eligible for food stamps in our neighborhood, we began to organize informative training and assistance in crossing the hurdles that people must climb to get access to the services our federal government offers the poor. When we began to see how damaging the insatiable consumer appetites of our neighbors and friends were and how damaging the debts incurred to the consumer are and how damaging the increasing waste is on creation, we started Make Something Day, the day after Thanksgiving-a day to celebrate creativity and gift giving, but not buying. Our story is not without failed experiments and terrible mistakes. Certainly! Within the intimacy of community, where everyone is known, we have hurt each other. When trying to serve others that do not come from the white, middle class background that some of us have, we’ve found how deep the wounds of our privilege are upon the disadvantaged. We have found ourselves chasing dreams that were not God’s from time to time. But, still, we see the beauty of God within a city where many do not, within the broken lives of it’s people and within each other. And we see enough to give us hope that God’s kingdom is still indeed coming. We are now within efforts to take what we have learned through our lessons in community to others through what we call, The Ecclesia Collective. Those within churches and those without., whether under the banner of an established church or amidst the disenchanted and disenfranchised, we all crave community that nurtures our spiritual formation and calls us each into missional engagement. In fact, with the continual decreasing numbers in church attendance, we often wonder if rather than starting new programs or new churches we simply need to plant communities in the fertile ground of a culture starved by consumerism and individualism.